We're a nation of victims, trembling in the corner. We've been pushed into that corner by Big Pharma, or Incompetent Medical Practitioners, who have robbed us of our rights, our dignity, our fortunes (aided and abetted by Heartless Insurance Companies). We would surely be crushed in that dark corner, were it not for the selfless Personal Injury Lawyer, looking straight into the camera and solemnly promising to Come to the Aid of Injured Citizens. Last summer a new appeal was launched on the airwaves: "If you or someone you love has suffered from Jaw Death ..." (cue dramatic music). Hmmm, our old friend osteonecrosis of the jaw. A class action suit was filed April 10, 2006, against Merck, maker of Fosamax. Hmmm, Merck, maker of Vioxx. Yummmm, deep pockets and a record of settling lawsuits. Parallel class action suits have been built and subsumed into the Fosamax suit for other bisphosphonate drugs Actonel, Aredia, Boniva, Skelid and Zometa. Didronel and Reclast are mentioned as bisphosphonates but I've not seen specific suits for these products. But wait! Is this as risky as it sounds, when Mr. Soulful Personal Injury Lawyer is crying Real Tears over your plight? The University of Alabama-Birmingham has put together an excellent site on osteoporosis, which includes this reasoned risk assessment. Kind of like putting sour cream on chili, to my thinking. 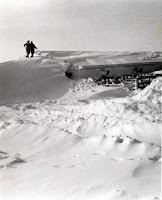 Today is the 30th anniversary of the blizzard of 1978. Where were you? I was a teaching assistant in the History Department at Indiana University. I'd finished my office hours in Ballantine Hall and walked over to the Main Library at 5:00 p.m. in light snow. When I emerged at 11:00 p.m., campus was covered with 18" of snow. All the buses had been pulled off their routes, so I walked a mile home. Fortunately I'd worn a parka and snow boots; another student approaching the bus stop by the library had not done so. She lived near me, so I walked home with her hanging onto the back of my jacket. I didn't see my car again until April when the last snowdrifts melted! We went yesterday to Cleveland for scans, labwork, and appointments. Still stable, so no change on medications or routines for now. Dr. G thinks one of my liver lesions may be a cyst rather than a tumor so he's reviewing all my past scans for clues. Funny to think of it - I've been on antiangiogenic treatments for 28 months now. I've never seen "shrinkage" in the best sense of the word (the medical requirement of 30% reduction), but we are all satisfied with stability. More on this appointment later - I have much to think about. My last two professional jobs required lots of computer time - first thing in the morning on arrival, the PC would be turned on, and I'd be in front of it most of the day. Twenty years of habit were hard to break until this past December when I swore I'd give myself a vacation from screentime. Well, break I did, and I have found it nearly impossible to re-start my daily sessions at the laptop. I have some volunteer duties that require computer access and I'm sadly behind on them, so it's time to buckle down and get all my routines back in place. I can't say that there's been much happening; it's been cold and damp, we've had some snow, and it's actually acted something like normal winter for a change. Marmaduke has been declared mildly diabetic (controlled with medication). I'm fatigued and having trouble with my joints (meds and weather). We go Friday for the next round of scans and tests in Cleveland. While I can't say that I look forward to this, I admit that I'm always relieved when the appointments are over, regardless the outcome - no more uncertainty. The fatigue and joint pain are "normal" enough that I hardly worry about them anymore, but persistent swelling and pain in my left knee is something new to be checked out. I guess it's always something. I've had a self-imposed moratorium on computer use for the last few weeks. My wrists have been sore, my eyes have been annoying me, and I've known full well that if I wrote here it would be nothing but complaints. So I've kept my mouth shut. Now I'm paying for it by reading through 157 emails and catching up with some volunteer work. Just before Christmas my "adopted" brother G died of colon cancer. Over 20 years ago I was absorbed into my friend C2's family and gained 4 sisters and 2 brothers in the process. G was a musician (and often a goofball); he was talented, a wordsmith and a wit. He ignored his health and died too young. In the last month of his life he came to terms with death - responsible about the final financial details, mending fences, telling people he loved them. His memorial service was packed, an SRO crowd for his final show. Last year I lost 4 friends to cancer. Let this year not hold the same!